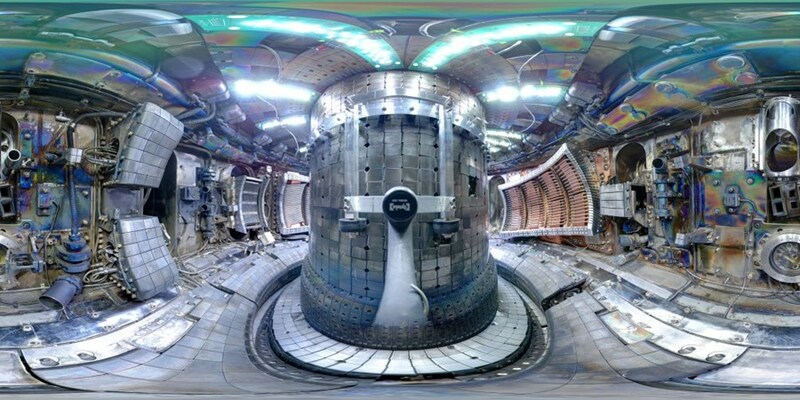 On Friday, 30 September, scientists and engineers at MIT's Plasma Science and Fusion Center (PSFC) made a leap forward in the pursuit of clean energy by setting a new world record for plasma pressure on the Alcator C-Mod tokamak. The world record was achieved on Alcator C-Mod's last day of planned operation. After 23 years of operation and approximately 33,000 plasma shots, the facility was officially closed in September. The results will be presented to the international fusion community by senior research scientist Earl Marmar at the IAEA Fusion Energy Conference that opens today in Kyoto, Japan. 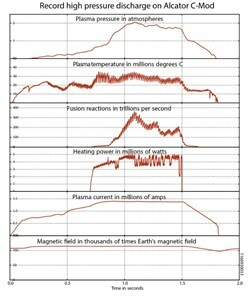 Plasma pressure is one of the key ingredients to producing energy from nuclear fusion, which demands that the product of three factors (the so-called "triple product"—a plasma's particle density, its confinement time, and its temperature) reaches a certain value. Above this value the energy released in a reactor exceeds the energy required to keep the reaction going. Pressure, which is the product of density and temperature, accounts for about two-thirds of the challenge. The amount of power produced increases with the square of the pressure, so doubling the pressure leads to a fourfold increase in energy production. 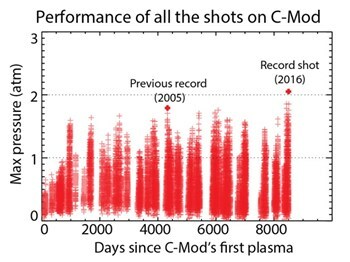 In the plasma pulse run on 30 September, MIT and guest scientists were able to achieve 2.05 atmospheres of pressure, passing the previous world record of 1.77 atmospheres that had been achieved in 2005 on the same device. 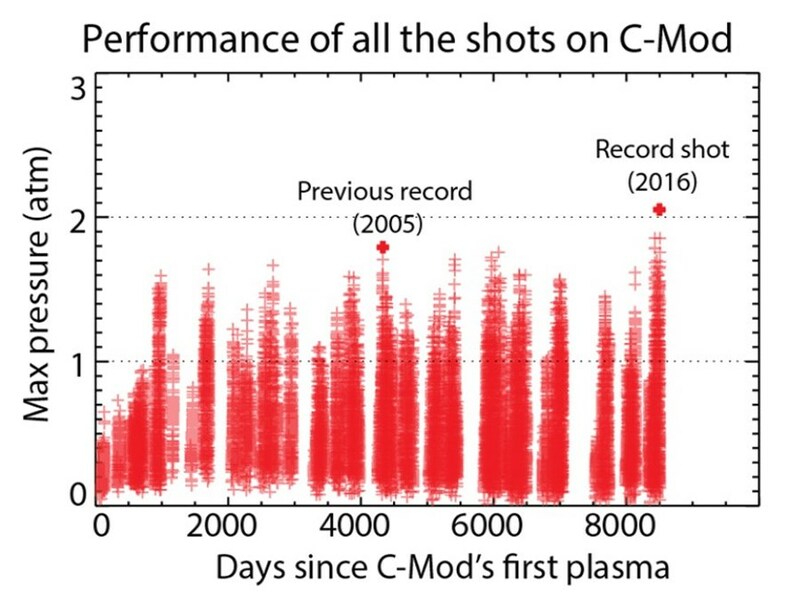 This result—an improvement of 15 percent—was achieved in a 35-million-degree plasma that lasted two seconds. This pressure record is likely to stand until the operation of ITER, which is expected to reach 2.6 atmospheres when in full operation. Three different strategies for breaching the pressure record were tried by the engineers, technicians, scientists and students present in the control room. Two came very close to reproducing the previous mark, and the third set the ultimate record. Two of the approaches, including the record-setting one, were led by scientists from other laboratories in the US, including the Princeton Plasma Physics Laboratory, the Oak Ridge National Laboratory, and General Atomics in San Diego. Each approach was thoroughly planned before hand and attempted sequentially throughout the day. "This is a remarkable achievement that highlights the highly successful Alcator C-Mod program at MIT," said Dale Meade, former deputy director at the Princeton Plasma Physics Laboratory. 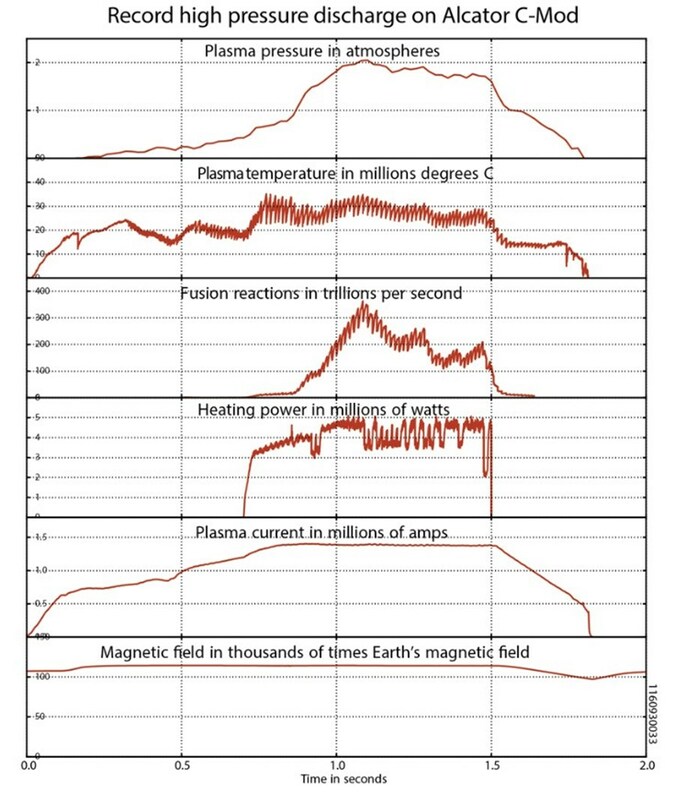 "The record plasma pressure validates the high-magnetic-field approach as an attractive path to practical fusion energy." Alcator C-Mod is the world's only compact, high-magnetic-field fusion reactor of the tokamak variety. The device's high-intensity magnetic field—up to 8 tesla, or 160,000 times the Earth's magnetic field—allows the device to create the dense, hot plasmas and keep them stable at more than 80 million degrees. Its magnetic field is more than double what is typically used in other designs, which quadruples its ability to contain the plasma pressure. C-Mod is third in the line of high-magnetic-field tokamaks to be built and operated at MIT. The result was achieved on Alcator C-Mod's last day of planned operation. The facility officially closed in September after 23 years of operation and approximately 33,000 plasmas. Read the original report of the world record on the PSFC and MIT websites.